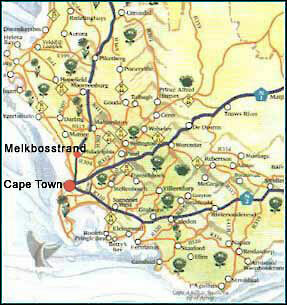 Melkbosstrand is a fast growing sea side town on the West Coast only 25km from Cape Town . We have a beautiful 6km long beach which is known for easy walking, surfing & kite flying. Areas that fall under Melkbosstrand include Van Riebeeckstrand, Duynefontein and Atlantic Beach Golf Estate. We are situated on a bay with Nature Reserves on either side, one of which has a hiking trail and during September, it is a pleasure to take a walk amongst the abundance of indigenous flowers ... and don't be surprised if you bump into one of the Bontebok, Springbok, Zebra or Ostrich, that live on the Reserve! Old Melkbos, the original village, still has a country feeling and fresh snoek can be bought off the beachfront regularly. During the season the local fisherman still enjoy fishing off the waters edge, locally known as "Harders Trek" and during whale season, one can watch the whales frolicking in the bay. 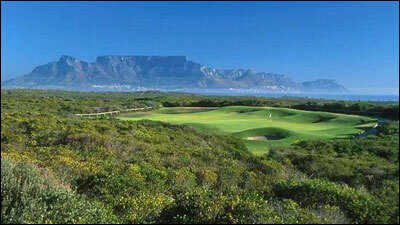 We also have an exclusive, fully secure, Golfing Estate with an 18 hole Championship Golf Course. Only a 20-minute drive from Cape Town makes Melkbos a popular and sought after residential area. When you return home, it feels as if you've escaped the hustle and bustle of city life and after a walk on the beach, or short fishing excursion, it feels as if you haven't been to work at all. Why don't you bring your family & pay us a visit or give us a call... you will be pleasantly surprised! To read a delightful piece of historical Melkbos, or Melkbosch as it was known then, please click here. This up market Estate with its tranquil surrounds has 24 hour Security and is situated on an 18-hole Championship Golf Course, which is managed by Teddy Weber, the resident Pro. Atlantic Beach has been designed to ensure that a comfortable and secure living environment and lifestyle is enjoyed by the residents of the Estate. With its abundance of different species of Fauna & Flora, the estate is a retreat of pure bliss, a piece of natural paradise that allows one to take in the natural beauty of the sea and to walk among the protected fynbos. The top class leisure centre includes a gym, swimming pool, & tennis courts, perfect for the active soul! And let's not forget the luxurious Club House with its restaurant & bar, as well as the function room. For the little ones, there are play areas and regular "kiddies" entertainment programs. So there you have it, Atlantic Beach Golf Resort not only caters for the avid golfer, but also for the nature lover, energetic fitness fanatic, entertainer, socialite, and families - young and old! In fact, it caters for just about anyone who enjoys a certain quality in life. Looking for property to buy or rent in Melkbos or wanting to sell property in Melkbos? Please feel free to complete the form below with your property requirements and we will contact you within 24 hours. How do you intend to purchase the property?